BUFFALO, N.Y. — When thousands fled the struggling Rust Belt city of Buffalo, refugees poured in to fill the void and invigorate the economy. Blighted blocks were tidied up by new arrivals from Iraq. Shops selling Ethiopian cuisine opened, and employers snapped up workers from Myanmar and South Sudan. More than 12,000 refugees arrived in the area in 10 years, helping stymie decades of dizzying population loss. But as the Trump administration throttles the flow of refugees into the United States and the president increases his anti-immigration rhetoric ahead of the midterm elections, Buffalo and other cities that rely on the new arrivals are beginning to feel the pinch. Big, burgeoning cities like San Diego and Dallas accept more refugees, but their arrival can resonate more in smaller, shrinking cities like Buffalo. The city, an old steel and shipping hub, had been locked in a long, losing struggle to keep people from leaving for places with less snow and more jobs. Refugees relocated with the help of four separate agencies to settle into empty homes and fill jobs at hotels, restaurants and factories. Buffalo, which had lost more than half its population since its postwar peak of around 580,000, is now hovering close to 260,000 people. 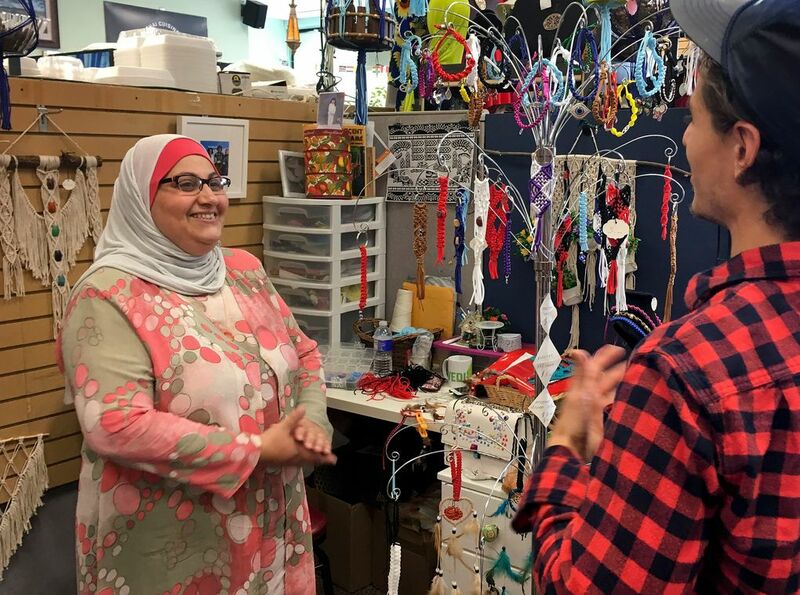 Yousef spoke from her booth at the West Side Bazaar, a retail space that was packed on a recent day with a lunchtime crowd buying halal food, bubble tea and dim sum served by refugee operators. 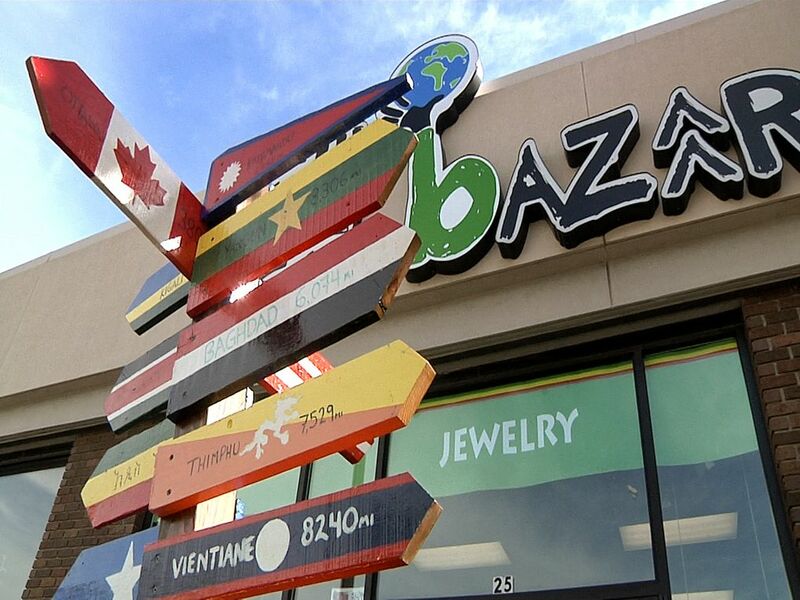 The bazaar serves as an incubator for refugee and immigrant entrepreneurs, some of whom open their own shops selling food from Laos or clothes from Africa. Yousef comes in after her 5 a.m. shift at a supermarket bakery to spend the afternoon selling handcrafted macrame products and international clothes. The refugee reduction comes as Central American migrants in Mexico continue their trek toward the U.S. border. President Donald Trump has seized the moment to renew Twitter attacks against Democrats for what he calls “pathetic” immigration laws. Trump last year cited national security in slashing the annual cap on refugee arrivals to the U.S. from 110,000 to a historically low 45,000. Only 22,491 refugees entered the U.S. last year amid a tougher review process. The effect in the Buffalo region has been dramatic. A metropolitan area that welcomed 1,934 refugees two years ago took in 686 last year and is on track to receive fewer than 450 people this year, according to an analysis of refugee-placement data by the Fiscal Policy Institute. Arrivals could dip more this coming year now that the Trump administration lowered the refugee cap again for this budget year, to 30,000. Refugees can cost money for localities in the short term, though there’s research showing they pay more in taxes than they receive in benefits over years. Some local politicians have criticized refugees’ cost and the potential security risk. But support for refugees is broad in Buffalo, a Democrat-dominated city. The Buffalo metropolitan area’s growth rate has lagged behind the national average. But more single-family homes are selling for more money compared to earlier this decade. There are multiple reasons for the uptick, but many see refugees as a crucial cog for growth. “We need this influx of refugees or we just become a flat economy again,” said Democratic state Assemblyman Sean Ryan. The agencies in Buffalo help refugees learn English, find housing and land jobs. At the International Institute of Buffalo, Caitlin Monan recently prepped a room full of recent arrivals for questions they might face during job interviews. She handed out a work sheet that listed such questions as: Tell me about yourself? Do you have transportation? Employers like Christ at Litelab and Avanti Advanced Manufacturing owner Jim Wei say they’ve had success with the refugees they hired. Christ recalled one applicant who was so committed, he biked to a job interview in snowy February. And more than a quarter of the high-end lighting company’s 153 employees are refugees. Litelab assembly-floor worker Majid Al Iessa once helped the U.S. Army in Iraq before fleeing the war-torn country. Now his two children are in school and he has a home in the suburbs. Wei and Christ, who volunteers as chairman of the board of the International Institute, are among city employers having a tougher time filling jobs now. And landlord Michael Maywalt, who credits refugees with helping renew the city’s Black Rock neighborhood, is noticing fewer refugee families seeking to rent his properties. Christ is still filling jobs and Maywalt is still renting apartments. But there’s a palpable sense of concern among refugee advocates about the sustainability of Buffalo’s modest resurgence.